ASOS is the directory to finding anything statement making, good quality and well-priced, making their variety accessible to everyone is the right thing to do. Outside of their own house brand, they offer collections from our favorite brands like Nike and Missguided. Boohoo is perfect for the gal passed F21 but not looking to spend Saks money. Their collections are the right mix of statement & basics making a revolving wardrobe easy to achieve. The maternity assortment is most refreshing because of it’s trend-forward while still keeping in mind the needs of your ever-changing body. My personal thus far! Naked Wardrobe is the oasis for luxe bodycon items to bring the heat up in any wardrobe. Fairly new to the maternity market, their signature midi & mini staples can make a sultry, sassy statement even during this stage. Your bump will never look so #haute. Target is our one-stop shop for all if not most life necessities. Grabbing some new style-candy along with your milk and waxing strips should be accessible at any size. 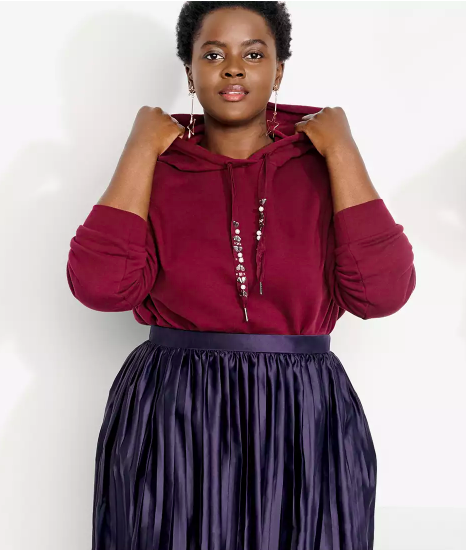 With quality and sass-friendly everyday staples from bejeweled hoodies, utility jackets and delicious leggings. Hey, feeling bold and beautiful is entitled to you at any stage or size of womenhood and brands, large and small, are getting hip to it. Now go, the world is your oyster.